After the weird teal-blue thing I made this beautiful sweater. I used what I learned from the first attempt, and looked at some additional patterns (from this search query). 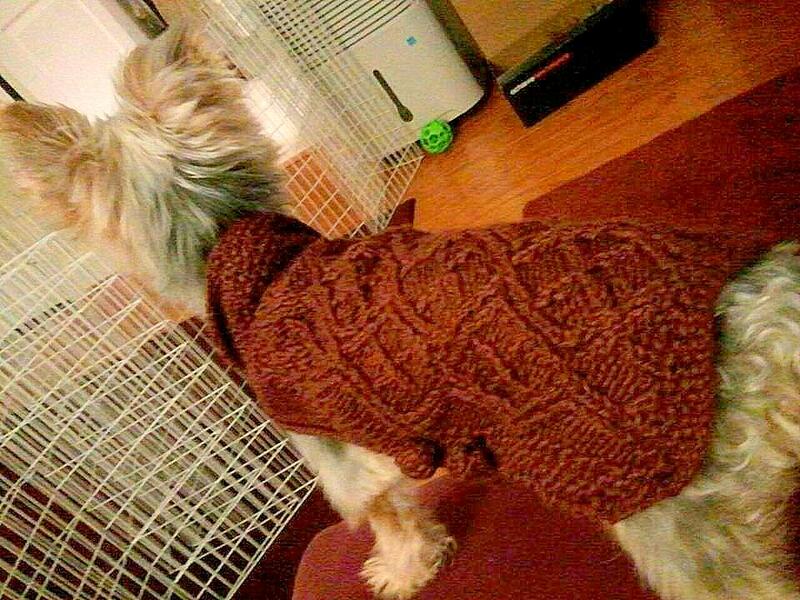 I also utilized my knitting library and found a cute cable argyle pattern from the Vogue Knitting Stitchionary. I think this cable pattern is what gives the sweater more appeal. What I love about this project - again, the ease in putting the garment on/off Rosie, the pretty and simple(!) cabled pattern, and softness of the yarn. While knitting I loved the yarn! In fact I had originally purchased the yarn for a sweater for myself. It is a beautiful soy-silk blend, so soft and light. 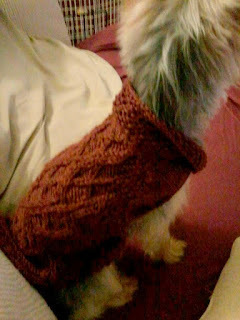 But what I hate about this project - after just an hour or so of Rosie wearing it (even while sleeping) the sweater stretches beyond belief! Such a huge disappointment. I am debating if I should just throw it into the washer and dryer to see if it'll felt. Yes I'll lose that beautiful stitch pattern - but at least then Rosie might be able to wear it! I am glad that I knit a small garment and noticed the droopiness and stretching of the fabric before spending a lot of time knitting a sweater for myself. Any chance you could sew something on the inside to add structure? Fleece seems the obvious thing, but I think it might stretch too much. Felt is probably a better idea. When in doubt, a cotton print will also do the job.